Software licensing tools are usually intended to be something that neither the user (you) nor the software vendor (us) want to have to think about often. In a perfect world, you activate or register your software, and then don't want to have to think about it again for a long time (e.g., perhaps until you upgrade the license or extend the maintenance subscription one year later). Although this is the case for many people, we have found that a growing number of our users want more flexibility and capabilities with how they manage their licenses. To address this, we've spent the last year implementing a powerful new licensing system that among other things, will make it easier for users to track and share licenses within an organization. 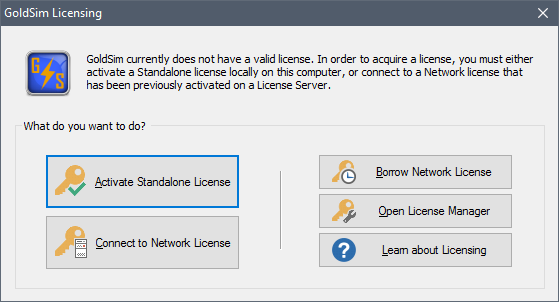 In this blog, I provide a quick overview of the new licensing features. The next release of GoldSim will use the Flexera licensing system. Flexera is used widely by many large software vendors (e.g., Adobe, Autodesk, ESRI), so many license administrators and IT staff will likely already be familiar with it. We will provide two types of standalone licenses: Desktop and Enterprise. All existing standalone licenses will automatically convert to Desktop licenses; you can optionally choose to upgrade to an Enterprise license. One of the key features of the new licensing system is the ease with which you can manage and transfer your licenses between computers. It can all be done very quickly (minutes) and without having to contact us. Desktop standalone licenses can be transferred up to 6 times per year. Enterprise standalone licenses can be transferred an unlimited number of times (e.g., daily if necessary). Network licenses will be much more stable and flexible than they have been in the past. Among other things, you will be able to "borrow" them from the license server (so that they effectively become temporary standalone licenses). This will be particularly useful if you need to use a network license remotely (e.g., on a plane or at a customer's site). You will also be able to open multiple instances of GoldSim while using a network license without utilizing more than one seat. The License Administrator for your organization can control who and for how long a license can be borrowed, and will also be able to track statistics on license usage. 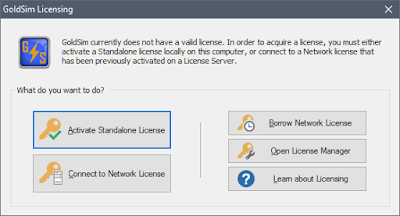 Whether you have standalone or network licenses (or both), your License Administrator will be able to manage all licenses via a License Portal (e.g., identifying the location and status of every license in your organization). Over the next several months, we will provide details on how the new licensing will work and how you will transition over to the new system (which should be relatively easy and painless).